If you own a kayak, then you probably already know that one of the most useful things that you can have is a trolling motor. If you do not want to paddle when coming back to shore, than a trolling motor is a must have. In addition, if you have any injuries or ailments that could prevent you paddling, then having a trolling motor would help. It would allow you to still enjoy kayaking without having to worry about how you are going to get around once you are on the water. 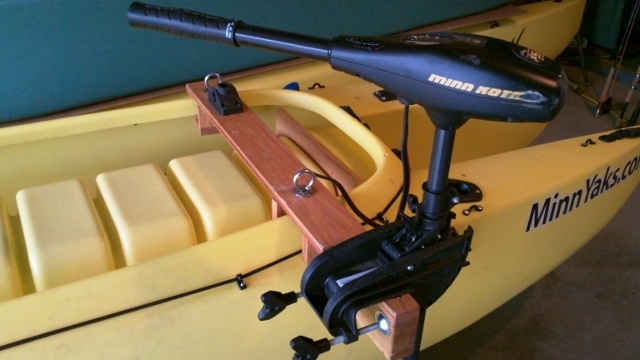 In this review, you shall see some of the best trolling motors for kayaks. You will also get a short guide to some of the most important things to look for when you are buying a kayak. This is one of the best trolling motors you will find today. It is made from some of the highest quality materials, and has been specially designed to be reliable and durable. 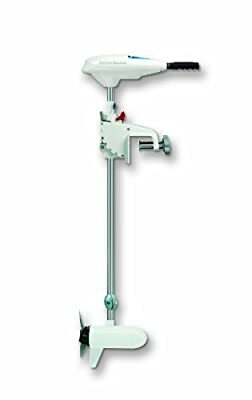 It has an adjustable thirty inch shaft for greater efficiency and performance. The motor is built to fit all types of boats including kayaks, dinghies, fishing boats and inflatables. The motor comes with an eight speed control system that has five forward and three reverse settings. However, it can be a little tricky to switch between the forward and reverse settings. As much as the motor can be used in saltwater, it should be washed thoroughly after it has been used. This will help to reduce the chances of rust, and increase the life of the motor. If you are looking for a trolling motor for your kayak, then this is a purchase that you need to consider. However, you must keep in mind that you will have to buy a marine battery separately. Minn Kota makes some of the best motors you can buy, and this motor is proof of their quality. 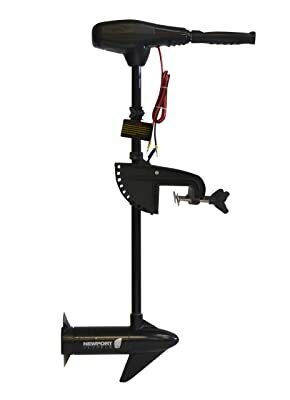 This high powered transom mounted motor is perfect for fishing trips, and comes with a 12-volt motor. The motor has five forward speeds and three reverse speeds and a thrust level of 30 for better acceleration. The 30 inch high-yield composite shaft is harder than steel. This means that you can enjoy your fishing trips knowing that your motor shaft will not break or corrode. 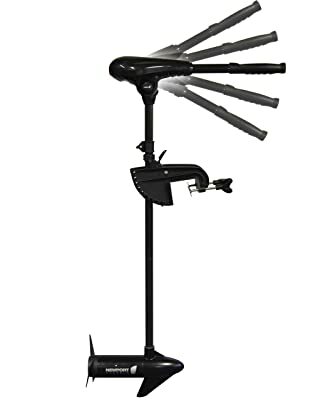 However, the best thing about this motor is the 6 inch telescoping handle, which helps give you finer control when steering. That, coupled with the tilt twist tiller helps to give you greater speed and control when you are in the water. 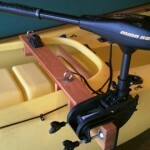 In addition, its light weight makes it easy to mount on your kayak. This means that you will be able to get on the water quicker. It also means that you will not have to worry about lugging around a big, heavy motor. If you are looking for a motor that will serve you well for a couple of years look no further. However, you must remember that the reverse gears are not very powerful, and that you will have to purchase a battery separately. The VariMAX series of trolling motors is one of the most popular motors that you can get right not. This beautiful trolling motor is ideal for both saltwater and freshwater use. It is made with corrosion resistant materials to ensure that it is durable and resistant to rust. The motor has a 36 inch shaft, which means that it sits a little higher than other motors. This means that it may be a little difficult for shorter people to use, though this should not be a problem for average to tall users. The motor is one of the most efficient you can find today, and promises to give you three times more battery life. This means that you can choose to use a smaller battery, or just stay out on the water longer. If you are looking for a motor that will be reliable, then this is the motor for you. This is an especially good motor if you plan to be trolling for a long time. The extended battery life will enable you to travel up to 10 miles, and even run up to eight hours. This is one of the most popular trolling motors you can buy right now. This motor is one of the most powerful motors that you will find, producing 46 lb. of thrust. This makes it perfect for almost any situation, and it can be used in a variety of vessels, including kayaks, dinghies, and small fishing boats. The power provided by the motor makes it perfect for both saltwater and freshwater use. In addition, the high quality materials that are used to make it mean that the motor is durable and resistant to rust. The motor also has an 8 speed control system that has 5 forward and three reverse speeds for better control. The 30 inch shaft is made out of composite fiberglass for increased durability. If you are looking for a trolling motor that will allow you to stay on the water for longer, then this is the motor for you. However, it is rather loud compared to some of the other motors on this list. This is one of the most powerful trolling motors you will ever find. This is one of the best motors you intend to use the motor in both saltwater and freshwater. The 55 lbs of thrust provided by the motor are more than enough to help you get through even the strongest wind and currents. In addition, the motor is made from stainless steel, making it durable and rust resistant. The shaft is 30 degree adjustable with a 6 inch telescoping handle. The 8 speed motor has 5 forward and 3 reverse speeds, giving you finer control of the boat. In addition, it has one of the largest shafts you can find, 36 inches. This makes it a little tricky for shorter people to use, but average to taller people will have no problem. The best thing about this is that it fits in a wide range of watercraft including boats, kayaks and canoes. If you own a larger kayak, or just want to stay out on the water for longer, then this is the motor for you. However, you are going to have to buy your own battery. Before you decide to buy a trolling motor for your kayak, there are some things that you should consider. Listed below are just some of the things that you should think about before making a purchase. The first thing that you should think about when you are buying a trolling motor for you kayak is the size of the boat. For instance, if you have a 16 foot kayak, then it would make sense to get a 12 volt 55 lb motor. However, if you have a 9 foot kayak, then you could use a smaller motor. In addition to the size of the kayak, the weight of the boat is also important. For instance, if you have a boat that weighs less than 1,500 lbs. then a motor with 30lb thrust would suffice. However, anything heavier than that and you will need a larger motor. Therefore, before you buy your trolling motor, ensure that you know how heavy your boat is. This is especially important, as many anglers do not know the weight of their boats. How Much Battery Space do you Need? The amount of space that you have in the boat will also determine the type of trolling motor that you get. Batteries for trolling motors come in 12, 24 and 36 volts. This means that you may need to have more than one battery to run the motor. Therefore, the amount of space that you have for the batteries will determine the type and number of batteries you purchase. This will also determine the type of motor that you can attach to the boat. This is very important, as there are some motors that can only be used in freshwater. For instance, the Minn Kota Endura is perfect for freshwater fishing. However, it would be completely ruined if you were to take it out on saltwater. In contrast, the VariMAX motor is perfect for saltwater fishing, as it does not corrode. The motor also has a special coating to help protect against corrosion. There are two basic types of trolling motors, transform mount and bow mount motors. 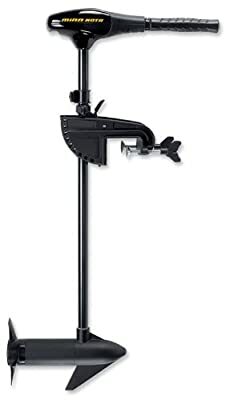 Transform mounted trolling motors are mounted at the back of the boat and are hand operated. However, bow-mounted motors are operated either by hand, foot or wireless control. They offer better control and maneuverability, but they are more expensive in comparison to transform motors. 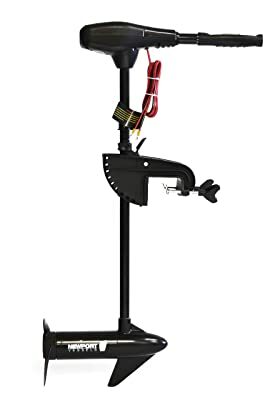 If you have an engine mount trolling motor, then you have no need to worry about shaft length. However, if you have a transform or bow mount motor, then you will need to know the size of your boat. Smaller boats can use a shaft length as short as 36 inches. However, the larger the boat, the longer the shaft length you will need. If you are looking for the best trolling motor for kayak, look no further than the motors listed above. They are all durable, high quality motors that offer superior performance and power. Not only will they save you from paddling, they may also help to reveal hidden fishing spots that you could not access before. If you choose any of the motors in this review, you will be making an investment that you will not regret.